While I am extremely disappointed, I cannot find fault with DC. They are within their rights as copyright owners to take this action. Unfortunately for me, it seriously hinders - if not makes impossible - my ability to keep up this fan site. I really depended on the public domain issues and with the tremendous gap of available comics it will a daunting task to keep documenting the stories and adventures of Captain Marvel. I've not been able to keep on a steady schedule with my various Captain Marvel blogs, but will continue to try to update them from time to time as I can! Again, I 100% respect DCs right to these comics! Here are a couple of Captain Marvel facts you might not be aware of! We all know that Captain Marvel has awesome powers and strength - but there are a few things he can't do! Captain Marvel himself shares these facts with us in the pages of his comics. 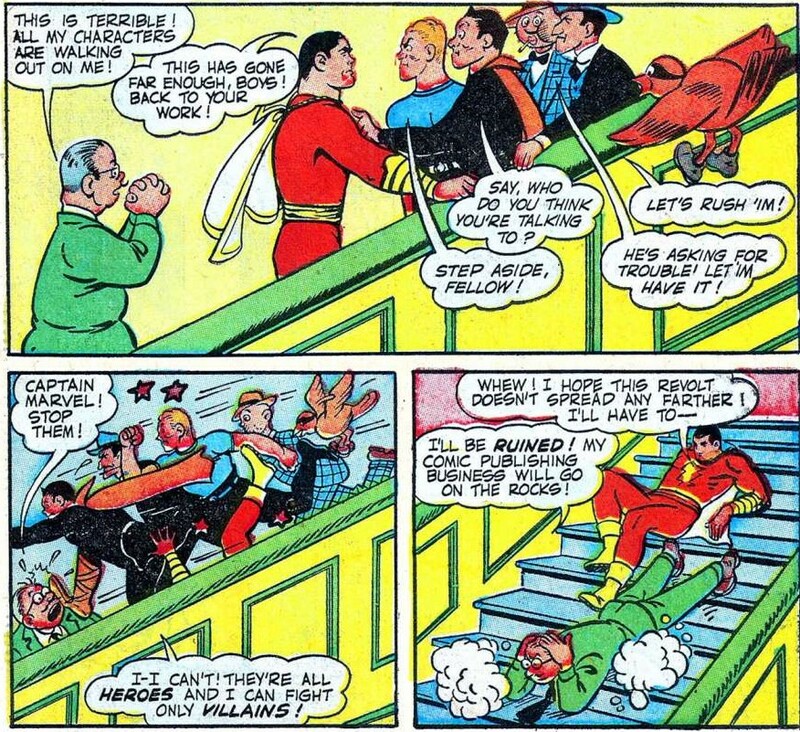 Captain Marvel can't fight other heroes! 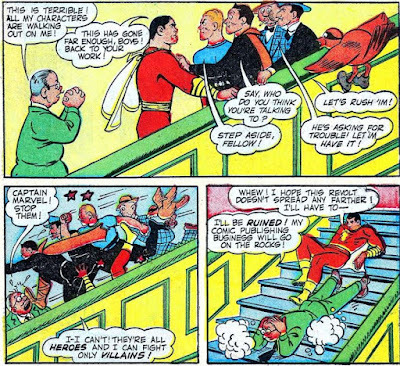 In Captain Marvel Adventures 22, in the story "Captain Marvel and the Revolt of the Comics" we learn this fact. As some comic book heroes are about to leave their publisher, Captain Marvel asks them to stop and they don't. Captain Marvel says, "...I can only fight villains!" Captain Marvel can't hit a woman! 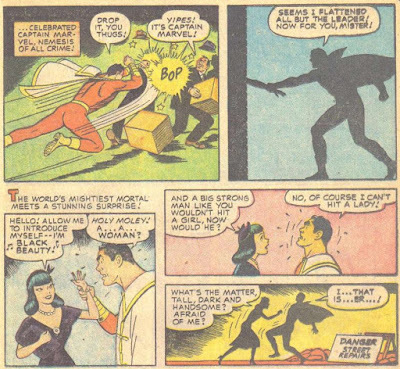 We learn this fact in the story, "The Beauty in Black" in Captain Marvel Adventures #142. Captain Marvel can't break the law! 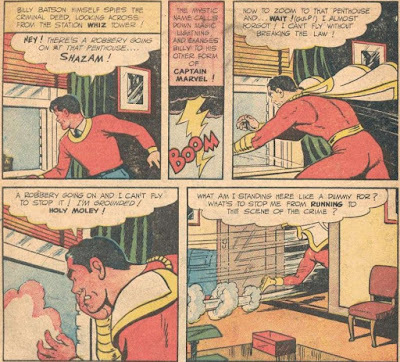 In Whiz Comics #95, Captain Marvel is grounded due to a plot by a villain. He's told that if he flys, he will be breaking the law. Cap let's us know he can't break the law! 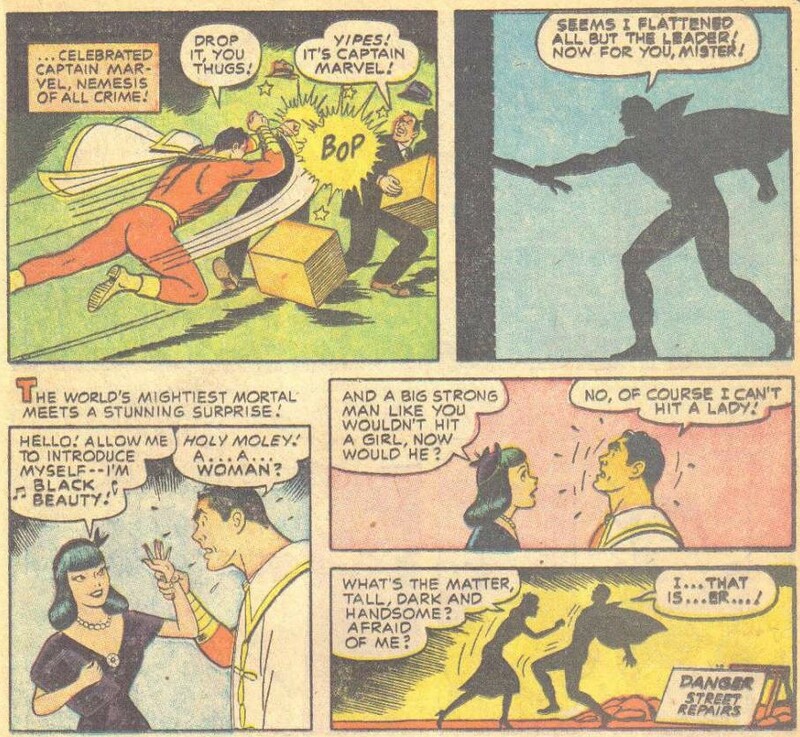 These are just a few more Captain Marvel facts from the pages of his comics! Of course, the things Captain Marvel can't do are in keeping with his character. Unfortunately, villains use these positive character traits against him - but in the end Cap always comes through!